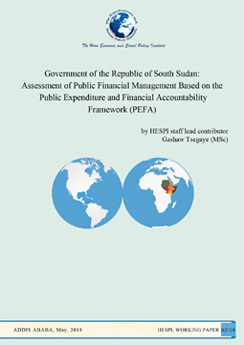 This study assesses the economic environment surrounding public finance operations of the Government of the Republic of South Sudan (GSS); the institutions, laws, regulations, and standards used by the government in the PFM process; the budget planning and implementation and how these are intertwined; the government’s control system on how mobilized resources are channeled to their intended destinations; the extent to which policy-based strategy and planning are used to integrate public finance with overall national policy directions; and the extent of transparency and accountability in terms of access to information, reporting and audit. The study provides an overview of the PFM system with evidence-based measurements. It will serve as a foundation for reform planning, dialogue on strategy and priorities, and progress monitoring. This assessment is meant to help the government achieve sustainable improvements in PFM practices across the range of important public financial management institutions, systems, and processes. The government and other stakeholders will also be able to see the implications of the overall performance results for the key goals of fiscal discipline, strategic resource allocation, and efficient service delivery.